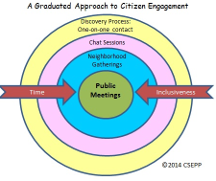 This is a proposal by the Center for Social Ecology and Public Policy (CSEPP) Inc., to conduct a Human Geographic Mapping project and develop a Citizen Issues Management program for the city of New Orleans. CSEPP is a non-profit devoted to policy initiatives that reflect the social realities of people living their everyday lives. CSEPP uses human geography to understand cultural boundaries in order to work within them where citizens are most powerful. The goal is to mobilize people to participate in enhancing their health and well-being, which in turn creates an improved civic life. New Orleans is composed of many distinct and recognized neighborhoods; Bywater, Treme, Garden District, etc. All neighborhoods experience problems that they wish to solve, such as crime, transportation, lack of employment opportunities, etc. Many outside agencies (police, charities, etc.) try to help. Often they apply programs previously tried elsewhere. Whether or not such programs have succeeded elsewhere, they rarely work as well as hoped when they are copied. Neighborhoods are complex, too complex and unique to expect one-size-fits-all solutions to work. And even well-designed programs will fail if the community doesn’t buy-in and support the initiative. 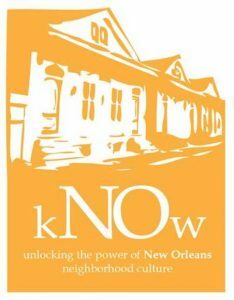 Know New Orleans is a different kind of initiative. We don’t have a community improvement plan to propose. We don’t pretend to kNOw any New Orleans neighborhood well enough to understand their problems or the best way to solve any of them. We propose to study neighborhoods and to develop issues management programs to unlock the power of neighborhood culture. If there is a place anywhere in the world where neighborhood culture can be harnessed to effect positive change, that place must be New Orleans. New Orleans has a history of strong, active neighborhoods. Outside groups have a function to play in helping neighborhoods solve their problems – police, schools, and charitable groups can contribute, government agencies can assist…..Charities often have a particular motivation and a fixed program or skill set. BUT the neighbors know what their issues are. And they know what their issues are today – government programs are frequently 5 years too late. AND the neighbors know which issues are most pressing– the issues they want action on now. Any meaningful initiative must be driven by and supported by the community. We believe a direct citizen engagement and mobilization process will yield specific and substantial benefits on the shortest possible timescale. The key technology we will apply is called Human Geographic Mapping (HGM). Most maps show political boundaries (city limits, state boundaries, etc.). A Human Geographic Map shows social boundaries. The legacy New Orleans neighborhoods are such social boundaries (or at least were at one time). The Irish Channel was once populated by Irish people who chose to live together because they shared a culture. It is not currently clear what meaning the legacy neighborhood boundaries have. Clearly the gentrified Marigny neighborhood does not have the same culture, or the same problems, today that it had 50 years ago, or even 10 years ago. People everywhere develop an attachment to a geographic place, characterized by a set of natural boundaries created by physical, biological, social, cultural and economic systems. Unique beliefs, traditions, and stories tie people to a specific place, to the land, and to social/kinship networks, the reflection and function of which is called culture. Supporting Services – health, education, law enforcement, etc. Physical Descriptions – neighborhood boundaries and internal obstructions such as rivers, railroad tracks, major highways, etc. HGM is not a new process; it has been used successfully for about 40 years by government and corporate entities to understand communities. Human Geographic Mapping (HGM) involves listening to stories from citizens about how they understand and work within their geographic setting. What are the natural borders people use to distinguish their neighborhood and community from another? As neighborhood describers enter the routines of the local communities and begin to participate in the rounds of daily life, patterns emerge in the stories told about survival strategies and the informal caretaking systems that make up any neighborhood. We want to identify these informal caretaking systems and understand their geographic scope in order to build a cultural base that anchors present and future action. In Phase 1 we describe the neighborhoods. In Phase 2 this knowledge is used to facilitate resolution of citizen issues to improve local conditions, foster trust in civic institutions and provide predictability for residents in working with the city. We call this process of management a Human Geographic Issue Management System (HGIMS). 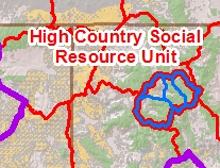 HGIMS is a means to integrate the interests and issues of citizens in their unique geographic settings with the resources of institutions. The goal is to foster an optimal mix of social, financial and natural capital on a predictable and permanent basis. It is a process of creating an environment of empowerment that comes from the “inside out” and “bottom up” through citizens participating in their own solutions. As the interests, issues and resources of neighborhood residents are brought to awareness of the formal institutions, strategies are developed for integrating informal and formal systems, optimizing city resources in the fullest manner. As citizens gain experiences in successful civic engagement, more and more citizens free up their energy to deal with the larger community challenges around them. The key is to start where people are and to ensure that collaborative strategies, including program and policy initiatives, reflect the social reality of people in each area. Ultimately this successful process becomes a functioning part of the culture and is handed onto the next generation who can independently own their future. The ultimate goal is to include the entire city of New Orleans. We will start with three rapidly changing neighborhoods in the ‘back-of-town’. These neighborhoods are historically and culturally significant. At least parts of these neighborhoods are in transition, especially the areas bordering the recently gentrified Marigny and Bywater neighborhoods. Soon after starting the study, CSEPP managers will recruit and hire local citizens to conduct the majority of the study work. 2015 New Orleans Neighborhoods, A Cultural Guide, Charleston: The History Press.